Sweet Home Alabama: Thanks, Casey! 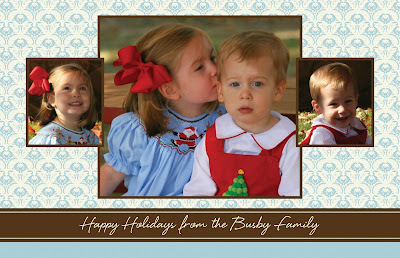 Here is our 2008 Christmas card! My very talented sister put it together for us. I just love it! Gee, wait... or is that someone else's? hahahahah! She is very talented and the card is beautiful! The card looks great & I love the pictures!! Keep that photo handy for when they grow up and become teenagers. They'll thank you for it.